Compact with three(3) different brushes for floors and upholstery. A 120 V 2 A power source for a possible power nozzle. The two(2) front swivel casters/wheels allow this vacuum to adapt efficiently to your vacuuming style. The 6 L (1.6 gal) tank capacity, its powerful 102" water lift capability, its 1100 W motor, and its maneuverability gives this compact canister vacuum the ultimate tool to have for heavy duty cleaning. The Hoover Air Steerable Pet Bagless Vacuum brings ease and performance to whole-home cleaning. The lightweight and easy-to-manoeuvre design effortlessly cleans around objects while the low profile design lets you easily clean under furniture and beds. Exclusive WindTunnel 3 Technology gives you the power you need to lift and remove deep down embedded dirt on carpet and hard floors for a thorough clean every time. Plus our AllergenBlock Technology and pet tools are ideal for pet owners and busy households. For over 100 years, Hoover has reimagined the way we clean, delivering a complete collection of trusted, innovative and effective solutions designed to make cleaning easier for active families so they can get back to what matters most. The M18 FUEL 3-in-1 Backpack Vacuum brings unmatched performance, portability, and versatility to the jobsite cleanup category. A POWERSTATE Brushless Motor and cyclonic technology delivers up to 2X more suction than the competition, allowing users to clean up drywall dust, concrete dust, wood/metal shavings and other common jobsite debris quicker and more efficiently. A quick release removable harness with an integrated canister hook allows users to wear, hang, and carry the product for ultimate cleaning versatility on any jobsite. At only 76 dB(A), the vacuum is up to 3X quieter than a traditional jobsite vacuum, allowing for quiet operation in occupied spaces. As a part of the M18 System of tools, it is powered by RED LITHIUM battery packs, which deliver up to 25-minutes of run time on a HIGH DEMAND 9.0 Battery Pack in high mode, and over 40 plus minutes of run time in low mode. For added convenience, the 0885-20 empties debris at the click of button, reducing downtime when the canister is full and allowing users to get back to the task at hand. Whether you are doing spot, area, or final cleanups, the M18 FUEL 3-in-1 Backpack Vacuum can go anywhere on any jobsite to complete countless cleanup tasks. 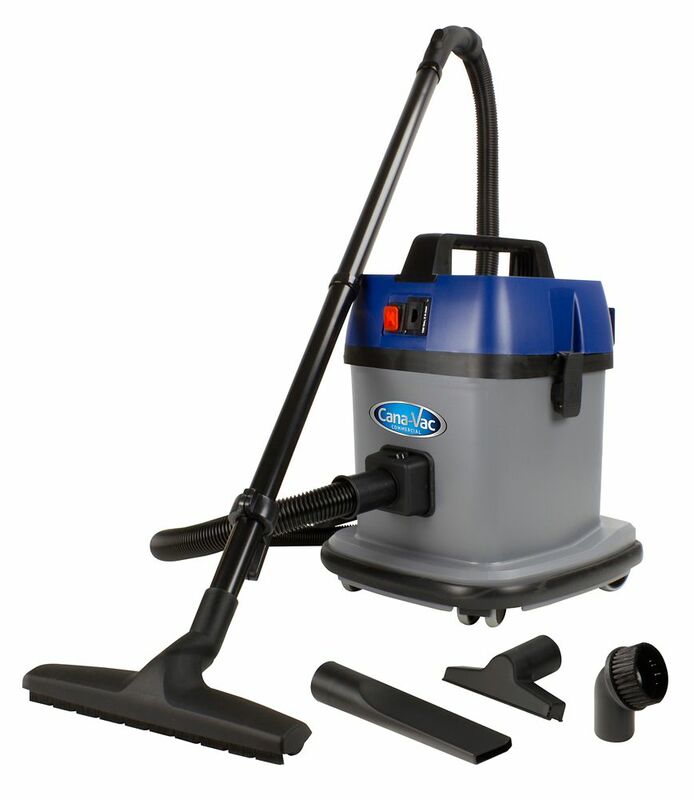 Commercial Canister Vacuum from Cana-Vac, 1.6 gal (6 L) Tank & Accessories Compact with three(3) different brushes for floors and upholstery. A 120 V 2 A power source for a possible power nozzle. The two(2) front swivel casters/wheels allow this vacuum to adapt efficiently to your vacuuming style. The 6 L (1.6 gal) tank capacity, its powerful 102" water lift capability, its 1100 W motor, and its maneuverability gives this compact canister vacuum the ultimate tool to have for heavy duty cleaning.